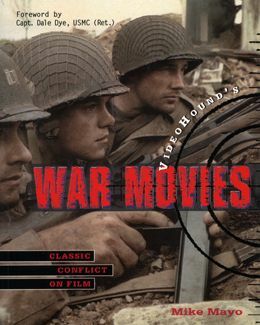 VideoHound's library of film reference books continues to expand with a new volume titled VideoHound's War Movies: Classic Conflict on Film. Most VideoHound publication are stuffed with so many entries that the actual film descriptions aren't much longer than those in VideoHound's huge, everything-on-video volume--VideoHound's Golden Movie Retriever. However, if the genre specialists who take over for VideoHound's separate genre-specific volumes aren't given room to write more than a single paragraph on each movie, the entire purpose of separate volumes is defeated. Thankfully, this new VideoHound publication by writer Mike Mayo tackles a relatively manageable group of movies. For example, whereas VideoHound's Horror Show (also by Mike Mayo) tackled nearly 1,000 movies in less than 400 pages, War Movies contains entries on only 201 movies spread out over 540 pages. So while there might be fewer entries in this new VideoHound publication, the increased length of the film descriptions allows the author room to provide more than simple quips. Now the author can discuss thematic concerns (gasp! ), acting, cinematography, and characterizations. Gone are the simple capsule summaries of most VideoHound publications. Now, the entries are as long as the movie reviews published in newspapers, averaging 400 to 600 words each. Mr. Mayo isn't afraid of going out on a limb. He skewers Thin Red Line for its pretentious narrators: "These guys sound and act more like English grad students than soldiers." And he attacks Coming Home for a "lack of understanding and empathy for the military." At the same time, he points out some of the lesser known gems, such as The Boys in Company C and Go Tell the Spartans, and some of the essential foreign war films, such as The Battle of Algiers and Fires on the Plain. The book is arranged according to wars. So if you're looking up a specific movie, you must identify which war it represents and then look in that section. This organization is somewhat cumbersome and confusing, but it allows the reader to get a better overview of war film history. So in the Korean War section, for example, you'll find M*A*S*H sitting beside Steel Helmet and The Manchurian Candidate. Each entry in War Movies is accompanied by choice quotes from the associated films. Sidebars on specific directors and actors help fill in the information gaps between the movie entries. The book also contains 200 photographs, as well as VideoHound's customary plethora of indexes. VideoHound's War Movies: Classic Conflict on Film is now available from Visible Ink Press. Suggested retail price: $19.95. Paperback.